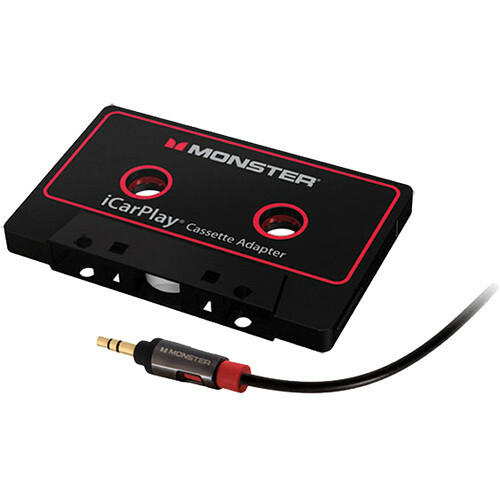 You'll be rocking down the road in no time when you use the Monster iCarPlay Cassette Adapter 800 for iPad, iPhone and iPod to enjoy music from your iPad, iPhone or iPod while driving. Simply put the included cassette adapter into your tape player and plug it into the headphone port on your Apple device. Then, just sit back and enjoy the tunes! Box Dimensions (LxWxH) 6.8 x 5.1 x 1.4"
iCarPlay Cassette Adapter 800 for iPad, iPhone and iPod is rated 4.4 out of 5 by 26. Rated 4 out of 5 by Jules from iCarPlay I previously used a Phillips cassette, but I couldn't fit the jack in my phone because of my phone case. I'm sure I'm not the only one with that problem. Purchased this one, because it's the only one with a straight jack, as supposed to a curved one. Great sound, but it lacks bass. I really prefer my previous one, but this does the job. Overall, the sound is crisp and I'm happy with my purchase. My only complaint is, I can hear the tape rolling. When I put on the music, it drowns it out, but still. I mean, really? I thought we were more advanced than that. Rated 4 out of 5 by NetDoc from Much better than FM transmitter I needed a way to listen to my iPod in the car which has a cassette adapter. I have been using a podfreq FM transmitter, which is OK when you are in a rural area but it is difficult to find unused FM stations in a large city, and you have to keep changing stations if you travel cross country. This is much easier, more reliable, and provides a stronger signal. The only issue I have is that the cord seems pretty flimsy and looks like it could be subject to breaking if you are moving it around a lot. Rated 5 out of 5 by gumby from Finally an adapter that works I have tried and returned at least four tape adapters since I accidentally ripped the cord off my last Monster iCarPlay. It has minimal hiss compared to any of the others I tried (and returned). You set your iPod to 50% volume and it actually registers at a normal volume. Unlike other ones where i had to blast both iPod and tape player resulting in awful playback. Rated 1 out of 5 by C.B. from Noisy in tape player, and only one side of speakers work. I thought that Monster would have a good product, but this is a piece of junk, totally a waste of money. I am not happy with this purchase. Gold parts don't make a difference with this product. B&H survey doesn't even give you a box to put a negative rating. You are required to give it a star, even though this product doesn't deserve one star. Rated 5 out of 5 by Sugar bear from What a monster of a product Just got this for 2004 350z Well made product better then the cheap ones from the discount stores. Tight fit better connection. Slow pace music you can hear the tape rolling but simple solution play your music loader. Great service at B&H knowledgeable people and friendly to. Rated 5 out of 5 by Caiti from Excellent Quality and Service I use the product with my iPhone to play podcasts and music through my car speakers. The quality is excellent and its very easy to use! Be careful with how rough you treat the component that connects to your iPhone or other device. If it bends, you are out of luck! Rated 5 out of 5 by None from Works Perfectly I used it with my various iPods in a 2005 Toyota Camry. The quality of the sound was much better than I expected. I also used it in my 2003 Saab and it was also great listening. I would buy it again if I needed another one. What works best with straight talk phone. will this work with portable CD players and mini disc players as well? No. I believe because it is a cassette, it only goes into cassette players on older vehicles/devices and adapts to the new technology of smart phones, etc.